Summer is the best time for going to the beach, spending time at the pool, having picnics and barbeques, and so much more. Unfortunately, a lot of these fun summer activities can take a toll on your hair. 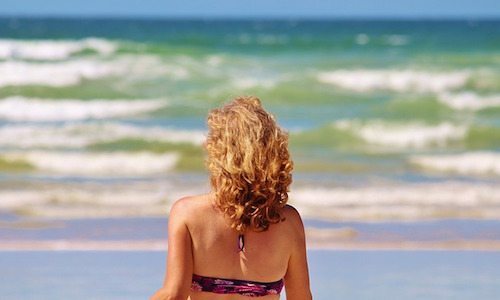 With all the damage and drying that the sun, saltwater, and chlorine can do to your hair, it’s no wonder most of us have brittle hair by the end of the summer! To start and end the summer with healthy hair we put together our favorite DIY summer hair care treatments. Mist and comb through wet hair and be on your way! Coat hair in coconut oil or jojoba oil and then pin up your hair. Wet hair, spray with a leave-in conditioner (like the one mentioned above), before putting on a swim cap for extra protection. Be sure to rinse and shampoo your hair after swimming, even in a lake or the ocean. Melt the coconut oil and shea butter in a double boiler. Let cool for a couple minutes before adding the argan oil (or substitute) and essential oil. Whisk together and then comb through clean, dry hair. Let sit for approximately 30 minutes before rinsing and shampooing. Combine in a spray bottle and shake well. After shampooing hair, spray a generous amount in hair, massage into hair and scalp and let sit for a minute or two. Rinse and enjoy! Keep in mind the vinegar smell will dissipate as soon as hair starts to dry. Don’t let hair damage get in the way of any summer activities. Keep in mind that as you swim, wash your hair, treat your hair, etc. that there is still a risk for head lice. As friends and families spend more time together in the summer, the risk for head lice continues. If you have questions about head lice or need a consultation or treatment, contact Pediatric Hair Solutions today!